As a manufacturer that provides system solutions that include rotary lobe pumps, planetary grinders (macerators), and twin-shaft grinders, Vogelsang has a unique ability to offer highly specialized pump packages and skids — a solutions class referred to as turnkey systems. Not only does Vogelsang engineer the individual products, it understands and provides the full solution, including, but not limited to: VFDs and panels for control, gauges and flowmeters for measurement, switches and sensors for safety, isolation rings, and valves. Vogelsang does offer standard packages but you’re certainly not limited to a “stock” system. The company looks at your processing needs, spatial requirements, and other environmental factors in order to optimize your system. Additionally, the pumps and solids reduction units come in a wide range of models, sizes, materials and tolerances, which allow Vogelsang to truly dial in the output you are looking for. It’s not that other manufacturers can’t deliver a packaged system but is important to understanding how they go about providing it. When a municipality specifies exactly what they want in their pump system, most pump suppliers will meet that need by cobbling together all the components to satisfy the specs. Different components may often have to be supplied by various vendors and with as many as half a dozen components, assembling and bringing a new pump system to start-up can take a lot of effort, frustration and time. With Vogelsang’s turnkey systems, you’re getting products and components designed by them. This means the integration is seamless, reliable and supported by one company — Vogelsang. Unlike companies that would have to call another manufacturer to add a grinder or solids reduction unit, Vogelsang has a long history of designing turnkey systems that utilize its own products. In addition to using its rotary lobe pumps, the company can include a RotaCut inline macerator for heavy solids removal and fine solids reduction of material when a specific particle size is required. Or when the application is better suited to a twin-shaft grinder, select one of the many XRipper models. 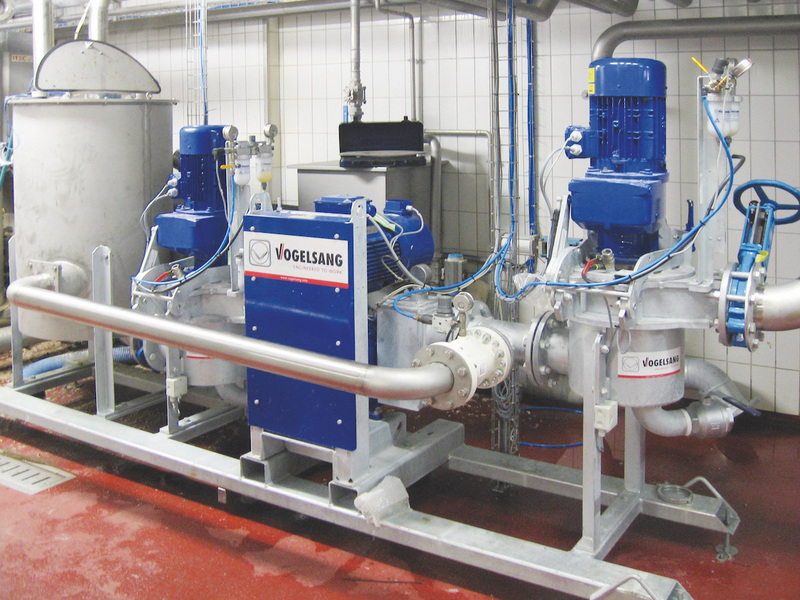 This combination rotary lobe pump and inline macerator is among the most popular of Vogelsang’s basic system packages. Not only is this unit a good choice for sludge and FOG applications, BioCut is perfect for various digester applications. This unit will ensure you have a homogenized feed of material going into your digester and it can protect your heat exchanger from solids and stringy material that cause clogs. Additionally, this is the ideal unit for fast, trouble-free digester clean-outs. These systems are also available in various sizes to meet your flow and solids handling needs. Overall, you get a compact design that includes its own control system, or one that can easily be integrated into your system. This unit, designed for dry solids handling, combines Vogelsng’s twin-shaft grinder, macerator and pump technology into one compact unit. While RedUnit has many more uses in industrial applications, this system is finding its way into municipal systems that are moving toward accepting food waste in addition to their FOG and septage receiving capabilities. Again, this unit can be customized according the requirements of the application and provides a true turnkey design — the entire assembly, including controls, is provided by Vogelsang. Typically, when you are looking at a system solution you’re considering how it will fit within a given plant layout. Not only will Vogelsang put everything on one compact skid, but the equipment is compact itself. The footprints of Vogelsang’s rotary lobe pumps are 40 to 60 percent smaller than progressive cavity pumps and even smaller yet when a belt drive (piggyback) design can used. All of this saves floor space and minimizes piping required to integrate the equipment. This is extremely important in retrofit applications where it is necessary to fit into a pre-existing space. However, in the case of new applications, it can save square footage for new equipment pads, or reduce excavation costs for equipment rooms that are in basements. Along with a system that saves time and hassle in setting it up, turnkey systems from Vogelsang allow municipalities to have a one-stop shop when they have questions. It’s so much easier to coordinate sales, installation, setup, service, training and troubleshooting through one supplier who has sole responsibility for the system. It also makes it easier to coordinate and purchase. One number, one call, one PO does it all. For systems that utilize multiple products, customers benefit from similarities the designs share. For example, many of the gearbox components of the Vogelsang’s twin-shaft grinder and rotary lobe pumps are interchangeable, such as seals and bearings, reducing the amount of spare parts. All equipment in a Vogelsang turnkey system is designed to be serviced inline. None of the components requires the disconnection of equipment or piping. This results in less downtime and reduces the manpower required to maintain the equipment. Each one of the major components in a Vogelsang turnkey system is easy to maintain, with each requiring less than 1 1/2 hours to do major maintenance. 1. First and foremost is that most system components have different lead times. Not only does this delay or lengthen completion of the project, bills for the various components become due at different times. Since idle parts do not earn any ROI, most companies try to coordinate when all the components reach the site, which is a difficult, if not impossible, task. A Vogelsang turnkey system guarantees that everything arrives at the same time. 2. It is common for someone to forget something. Invariably, it is not the main component; it’s a 10-cent part holding up the $100,000 project. This issue goes away when buying a turnkey system. Vogelsang makes sure all parts are included in the system before it is shipped. 3. The length of time to complete a piecemeal system varies based upon size and scope of the system. When components arrive at different times, it can take anywhere from three weeks to several years if it is a megaproject. On larger projects, this becomes more and more problematic. To ensure the system works correctly, a factory technician must work on each part one at a time. Each part might be working just fine, but if one of them is not set up or configured correctly, it appears the pump is not working. With a Vogelsang turnkey system, everything is set before it ships out, and the technician can work on the system at one time and has one call to make to troubleshoot any problems. Vogelsang’s goal in offering turnkey systems is to create a seamless end-user experience. Since marketing the turnkey system, Vogelsang has supplied dozens of satisfied customers. Need more details or want to discuss a system concept you might need? Contact John Richert, Vogelsang National Pump and Systems Product Manager at 330-319-0242 or johnr@vogelsangusa.com. Visit www.vogelsangusa.com for more information.